To the victors go the spoils- and the play. The War of 1812 was scarcely six months old when Constitution, under the command of Commodore William Bainbridge, defeated the British frigate Java off the coast of Brazil. The December 29th battle came only four months after Constitution had dispatched HMS Guerriere, and so by the time the ship returned to Boston in February 1813, the city and the nation were in a festive mood. Greeted like a conquering hero, Commodore Bainbridge received the acclaim of Boston’s citizens when he stepped ashore at Long Wharf on the 18th. Local militia companies, including the Ancient and Honorable Artillery Company, led the procession. Bainbridge joined Commodore John Rodgers and Captain Isaac Hull, and the whole merry band marched up State Street to the Exchange Coffee House. Whose thunder wakes the flood! 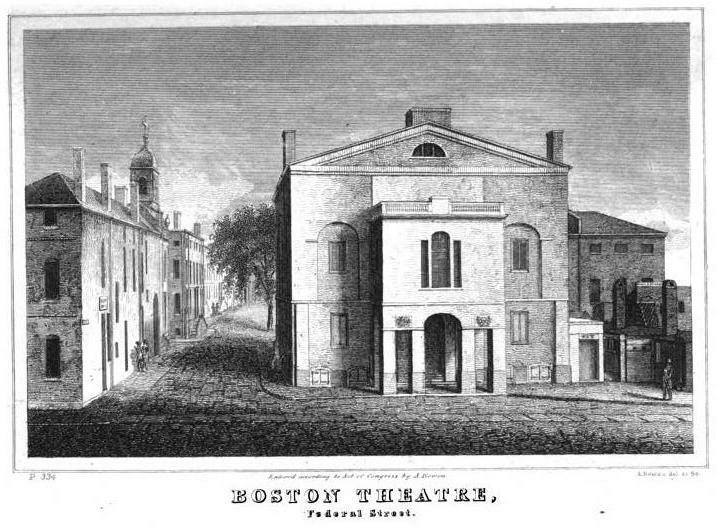 The second Federal Street Theatre, from Caleb Snow’s 1825 History of Boston. The edifice lasted until 1853. Well do we remember being at the Federal Street Theatre, when the news of this victory [over Java] was announced from the stage by the manager, Mr. Powell; and shortly after, when the gallant Commodore, together with some of his officers appeared in one of the boxes, the whole house resounded for many minutes with the cheering of the audience. The veteran Cooper, then in the prime of life, was in the second act of Macbeth, and although he stood a little behind the scenes, entirely forgetting the gracious Duncan he had murdered, we saw him swing his cap round with as much enthusiasm as any one. The Managers respectfully announce to the Public, that by permission of Commodore Bainbridge, The Crew of the U.S. Frigate Constitution will attend the Theatre this Evening; on which occasion the whole of the Pit will be appropriated to their accommodation, and no ticket will be sold for that part of the house. The Managers presume no apology is necessary to the usual frequenters of the Pit, as they feel confident that they will cheerfully relinquish their seats to the BRAVE TARS who have fought, bled and conquered for them. Commodore Bainbridge, well aware of the temptations that awaited his high-spirited crew, gave them a stern lecture the morning before the festivities. The crew, neatly dressed in blue jackets, scarlet waistcoats, new neck handkerchiefs, and glazed hats, quietly and orderly filled the pit. By all accounts, they enjoyed themselves immensely. Their decent mirth and jollity transferred itself to the boxes, and the evening passed off with great éclat. When Commodores Rodgers & Bainbridge, and Capt. Smith, with their Lieutenants, entered the box which had been fitted up for them, the whole Crew rose, and gave three loud and hearty cheers. The patriotic sentiments interspersed in the songs of the performers, and the transparent paintings, exhibiting the five glorious naval victories, were received by the gallant tars with repeated bursts of applause. At the name of their brave commander, they sent up a shout that literally ‘tore the concave.’ We venture to believe, that the whole universe never exhibited a finer crew. About 11 o’clock at night they left the play house and returned peaceably to their ship. Among the ‘thousand ships’ of England, there probably is not a single crew, three fourths of whom would not have deserted, had they been allowed an opportunity like this. Had some of the sailors known what was coming, desertion might have seemed like a good option. This was to be a final frolic before 150 of them made the long overland trek to join the American squadrons on Lake Ontario and Lake Erie. But that’s a story for next week. Theatre, Boston,” Winterthur Portfolio, Vol. 6 (1970), 185-208. New England Palladium, 4 April 1813. New England Palladium, 16 April 1813. Independent Chronicle, 12 April 1813.